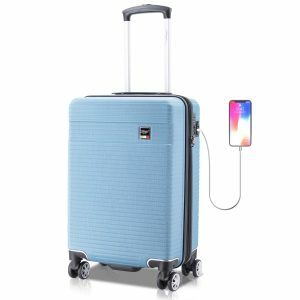 Aqua Villagio CT9005 is a hardshell and expandable carry-on bag with a convenient USB port, TSA compatible lock on slash proof zipper, eight wheel spinners. 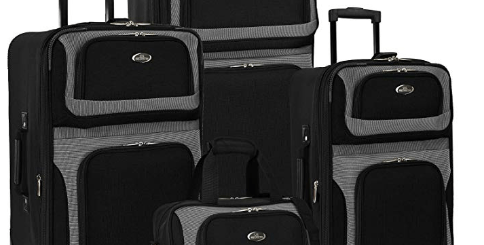 Being a very new release cabin luggage that first appeared at Amazon.com only in March 2019, it is rated 5 out of 5 star by two customers. The Italian Villagio Luggage has a rather nice brushed matte finish for a more sophisticated and modern look. It weighs 5.9 pounds and measures 22 x 14 x 9 inches including the spinner wheels and the handles and can be expanded by another two inches. The interior dimensions are 20H x 14W x 8.5D inches- offers ample space with a few pockets, dividers and straps. It has the ergonomic gel grip handles for your comfort when handling this luggage. The lower carry handle offers maximum grip at different angles. It comes with the rubber coated heavy-duty dual inner spinner wheels that move 360 degrees- in pretty much all directions on even rough terrains, giving you very high ride comfort and offers easy maneuverability in small spaces. There will be a lot less burden on your shoulders and body when you move this bag around. You will gain around extra two inches with the expandable zipper in the middle. 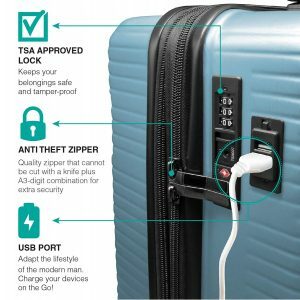 The main zipper has an A3 combination lock for additional security and is TSA approved, so the TSA personnel at the airport terminals can open your luggage for security check without needing to break the lock. The anti-theft main zipper seems very high quality- can’t be cut with a knife. You can charge your phone, tablet or laptop on the go with the built-in dual USB port with two USB slots for two cables. You just need to put your power bank in the elastic pocket. It has a spacious and detailed interior with multiple pockets- a mesh zipped divider, a zipped mesh pocket, a dedicated shoe pocket, a zipped divider for better organization and cross tie-down strap to keep your clothes in place. Your stuff will be easily viewable and accessible with the mesh dividers and pockets. The high-impact and scratch resistant multi-layered polycarbonate material used on this bag is both lightweight and strong and makes the bag very sturdy and durable and resistant to impact and water/rain. The Villago CT9005 Hardshell Carry-on is lightweight, sturdy, durable, ergonomic, comfortable, user-friendly, spacious, very nice looking and offeres at a reasonable price for what it is. The expandable size may not be allowed for carry-on on some airlines abut will fit in the overhead bin above you on almost all planes. Overall it gets the job done very well. You will get a two year warranty by the manufacturer along with a decent customer support- help when you need it.